Take advantage of JFK Lawn & Landscape’s residential landscape services for all your planting needs. We are currently in the heart of summer. It can be hard to find time for your landscaping efforts when you are away on vacation, at sporting events, or busy spending time with the family. For this reason, we have compiled a list of a few easy landscaping ideas that require minimal time and effort. Consider the following and enhance your property’s curb appeal in no time! Flowers are a major part of summer landscaping. Nothing says summer like seeing a front yard landscaped with bright, beautiful flowers. When it comes to flowers, there are three major categories. This includes perennials, biennials, and annuals. Annuals are the flowers that will only last one growing season. Some examples of annuals include sunflowers, geraniums, cosmos, snapdragons, and strawflowers. Biennials are flowers that will last for two years but do not reach their aesthetic peak until the second year. 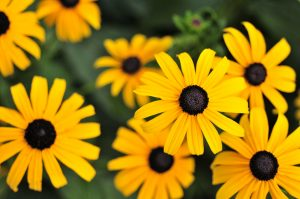 Examples of such include black-eyed susans, poppies, and wallflowers. Lastly, perennials are flowers that return every season and for that reason, are very popular for landscaping. Popular types of perennials include hydrangeas, bleeding hearts, and tulips. Planting vegetables is incredibly rewarding. If you have never done it, you do not know what you are missing out on! This is something the whole family can do. If you don’t want to plant a full vegetable garden, you could just as easily opt for planters instead. You just need to do your research and choose the vegetables that will thrive in your area’s climate conditions. Pay attention to which vegetables need full sun, which ones can grow in partial shade, etc. Not only do vegetable plants look nice, but they can save you money at the grocery stores. Wouldn’t it be nice to have to an array of tomatoes, peppers, zucchini, and other tasty vegetables available for the picking this summer? P.S don’t forget the pesky deer and rabbits that would love to munch on your new vegetables. Click here to refer to our deer resistant blog post to learn about the top deer repellent products on the market today. Landscape border edging is a great way to add some character to your landscape. If you want your yard to look neat, trim, and precise, consider installing a border around your lawn. This can be done using materials such as brick or concrete. After you chose the material for your border edging, you need to start leveling off the ground. 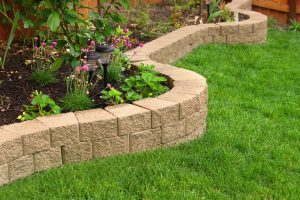 Once that is complete, install the border edging in the ground and secure it using sand or gravel. This entry was posted on Sunday, July 1st, 2018 at 9:01 am. Both comments and pings are currently closed.